Mrs. Fox has a recurring abscess that is affecting her Incisors and making one grown behind the other, although she makes a grating noise whn she is sat “at rest” her weight is very good and her eating not affected. Decision was made to leave the teeth alone for now, the Molars are fine, but they will be monitored. There is a lot of thickening/scar tissue in the abscess and although there are 3 pockets it is very small and difficult to flush or apply topical baytril. Mrs. Fox is having Baytril @0.4ml x2 daily (and probiotics of course) and applied topically to the wound/pocket, also some Rimadyl @ 5mg daily to take down any inflammation that might be present. But the most useful product we are trialling is a Green Clay from Gorgeous Guineas that draws pus from abscess before it is flushed. The abscess was lanced under a local anaesthetic with no fuss from Mrs. Fox. 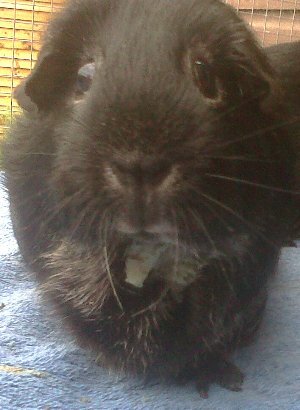 See: Guinea Pig Welfare’s abscess page. Wearing her Green Clay mask that draws out pus.